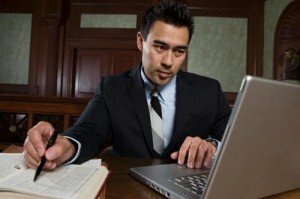 If you are wondering how to become an attorney, you may be interested to know the benefits of this career. Many people decide to pursue a career in law because of the potential pay. The Bureau of Labor Statistics indicated that the median annual wage for this profession is $112,760, which is significantly higher than that for all legal occupations combined. The top 10 percent of earners in the field earned over $166,400. In addition to this high level of compensation, lawyers tend to have the respect of people in the community and are trusted as a knowledgeable source of information. You also have an intellectually rewarding career that provides the opportunity to help others, as the University of Law states. An attorney works to help individuals, businesses and the government with legal issues and legal disputes. While many people think of the high profile trial lawyer when they think of professionals in this field, attorneys fill many different roles in addition to representing their clients in the courtroom. Behind the scenes, they conduct research and provide legal advice to their clients. They also help interpret vague laws so their clients can make informed decisions. They may produce and deliver legal documents, such as wills or divorce agreements, and will help businesses get started legally. Lawyers may also have many different titles. Prosecutors are attorneys who file charges against those who have violated the law. Defense attorneys work for those who have been accused. Counsels are attorneys that provide legal counsel for businesses, government agencies and sometimes individuals. Lawyers can also specialize in a particular field, like real estate, family law or taxes. To become a lawyer, you must first complete four years of undergraduate study. While you can opt for pre-law, it is not necessary a requirement for law school, according to the Bureau of Labor Statistics. However, you do need a program that is heavy in public speaking, government, history, economics and English. You can complete this part of the process online or in a traditional classroom, but you will need a bachelor’s degree before heading to law school. Law schools require their applicants to pass the Law School Admission Test (LSAT). The LSAT is designed to determine the student’s aptitude for the rigors of law school. The next step after passing the LSAT is applying to law school. Most states require future lawyers to attend a school accredited through the American Bar Association. Law school takes, at a minimum, three years of additional study. Students who successfully complete law school receive a juris doctor (J.D.) degree in law. Many students will opt to specialize in on particular area of law, which is the area they will eventually work in when they are an attorney. The final step in becoming an attorney is passing the bar exam. Each state has a series of exams that potential lawyers must pass in order to become licensed as a practicing lawyer. In most instances, lawyers must pass the bar exam in any state in which they intend to practice law. The bar exam is highly competitive, which means many lawyers do not pass the first time they take it. Students can take the bar exam multiple times if they fail to pass it on the first try. Becoming a lawyer means a significant amount of time spent in school, but the potential rewards and fulfillment are worthwhile.